Thanks for reaching out to us with your concern about the difference in the look of the product packaging, I can totally see your confusion. We have recently changed our product container from clear to white and so the picture is different on our website than the what the product is now. We also changed to a different lab for our formulation and while the main ingredients and formula have not changed, we have improved upon it a little and so there is a slight change in the ingredient deck. 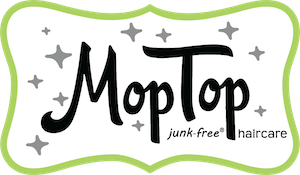 Hope this helps answer your question and thanks for your loyalty to MopTop Hair Products!